i bake for you :): Macarons! Last time I tried making them, it didn't quite work out. This time.. it worked! But only after a few tweaks with the oven temperature. Too high of a temperature will make the macarons crack and you won't get the 'foot' or they won't 'pop' (as some people call it). The macarons are chewy on the outside and soft on the inside with a very slight hint of green tea flavour amongst the almond. Draw circles of about 1.5cm diameter onto the back of the baking paper that you will be using. You may need 2-3 sheets depending on the size of your baking tray. Heat water with caster sugar until 116C using a candy thermometer. In another bowl, whisk 55g egg whites until soft peaks are formed. On low speed, pour the hot syrup slowly down the sides of the bowl. Whisk until combined and thick and smooth in consistency. Mix 1/3 of the meringue into the almond meal mixture. Then gently fold the rest of the meringue into the mixture within 20 strokes. Place into a piping bag and pipe circles out onto baking paper lined trays. Sprinkle with remaining almond pieces that were sieved out earlier. Allow to dry out for at least 1hr or until a skin is formed. 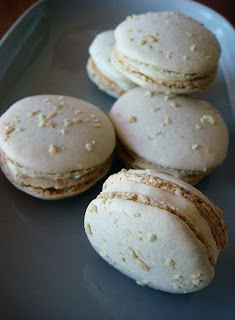 Bake macarons at 180C for 3 minutes, then down to 150C for another 5 minutes or until cooked. Bake one tray at a time. Allow to cool for a few minutes before removing from baking paper. Then allow to cool completely before applying ganache. They look beautiful - nice job!